As comfortable and relaxing as the French countryside! Our Amish made Abilene Ladderback Dining Room Chairs are proudly made in the USA from 100% solid hardwood using Old World craftsmanship techniques! These French Country dining chairs feature the typical ladder-back design and the option of a woven fiber seat, which is also indicative of the French Country style. Our solid wood Abilene Ladderback Dining Room Chair features a molded seat and tilt back. 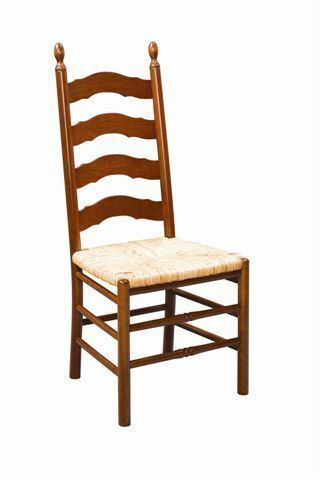 This Abilene Ladderback Dining Room Chair is available as an arm chair or side chair. Choose button finials for a more contemporary look or the traditional finials for the traditional Abilene Ladderback Chair look. The Ladderback Dining Room Chair is one of our best-selling dining room chairs! These Abilene Ladderback Dining Room Chairs are available in a variety of wood types and many stain selections. Purchase a set of these gorgeous ladderbacks with your choice of wood type and stain option to give it the personalization you are looking for. Questions? Call our Amish furniture specialists at DutchCrafters today to get answers on our solid wood, Amish Abilene Ladderback Dining Room Chair. We'll be happy to send you stain samples or to help you with your order - a 30% deposit is all that is required. DutchCrafters offers a wide variety of beautiful French Country Dining Room Furniture. 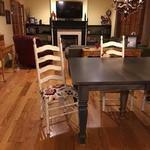 Check out the matching French Country Swivel Bar Stool and the French Country Bar Stools. Note: Customer can provide their own upholstery. 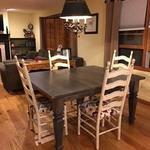 Attached are some picture of my fabulous new dining table and chairs. The quality exceeded my expectation! 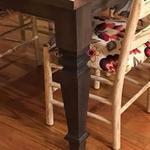 My husband was very impressed with the craftsmanship and the finishes on both the chairs and table. 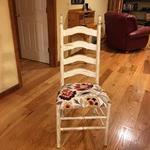 The handcraftsman who built my chairs did a fantastic job with the upholstery. Each chair's cushion completely match each other. Pattern placement was 100% identical. The option to use my own fabric gave me the perfect chair for my esthetic and decor. I have to thank you for your guidance thru this process. Your patience in answering my questions and ordering and reordering samples. I was able to take my time to choose what I really wanted and made furniture buying fun. Everyone that visits asks "Where did you buy the gorgeous dining table and chairs?" and I proceed to give all the details of the wonderful experience I had with Dutchcrafters. Thank you for your wonderful customer service. Very much appreciated!! Thank you for arranging my request. I have had wonderful customer service with DutchCrafters and it is appreciated! I just wanted to tell you that the dining chairs are beautiful and match PERFECTLY with the table!! I know we have a few more future purchases that we will make on the horizon, so I will contact you when we are ready!